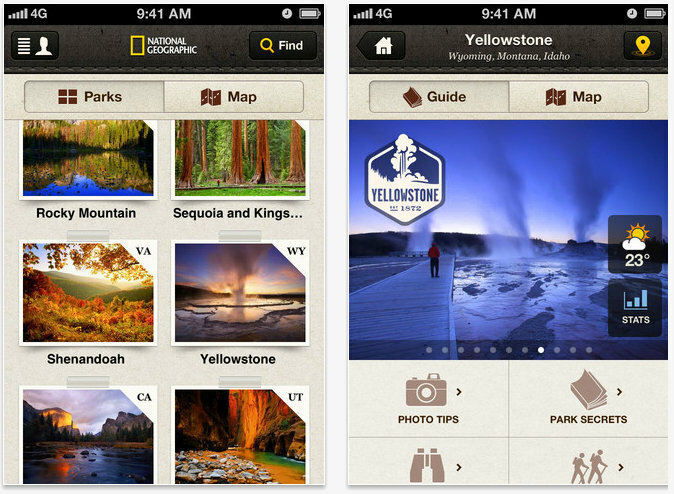 National Geographic presents a new, beautiful, and interactive guide to the national parks with a new app for iPhone. Whether you are seeking inspiration and planning your next trip or you’re looking for the ultimate in utility, National Geographic has everything you need to explore the U.S. national parks at your fingertips. Watch for updates as we continue to add more parks. Collectible park stamps and more! Each park guide has all the information you’ll need to know before you go (or get while you’re there! ): local time, weather, how to get there, when to go, where to camp or stay, what to do, what to see. Plus, each park guide comes with a custom-designed stamp—collect one at each park you visit. National Geographic is known for its photography, and this app is no different. Explore the parks—from Joshua Tree to the Everglades, from Acadia to Zion—through spectacular images and never-before-seen vintage shots. Plus, learn how to re-create the best photos from the experts: the National Geographic photographers.